Fans who follow Country Music Hall of Famer Charlie Daniels online may have noticed what appears to be a serious infestation of boll weevil bugs on his social media accounts and website. As it turns out, those critters aren't boll weevils at all. 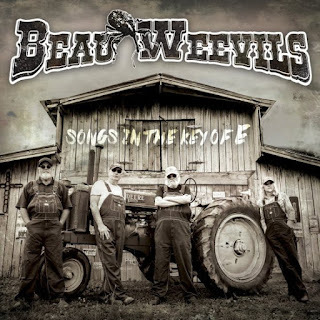 They're actually, "Beau Weevils," and are a nod to Daniels' upcoming studio album, Beau Weevils - Songs in the Key of E, set for release on Friday, October 26. "Beau Weevils - Songs in the Key of E is the culmination of a long held desire of James Stroud and myself to do a project together," says Daniels. "We had worked together, with James in the capacity of producer, which had resulted in some of our most successful albums for The Charlie Daniels Band, but James is one of the finest and most soulful drummers in the business and I figured we could get together, musician to musician, and come up with something special. We just needed a vehicle in the form of songs that would fit the bill." A staple of the southern rock scene since early 1970s, Billy Crain has performed with The Allman Brothers Band, The Rossington-Collins Band, The Rolling Stones, ZZ Top, The Outlaws and the Henry Paul Band. He's the brother of the late Charlie Daniels Band guitarist, Tommy Crain. Longtime Charlie Daniels Band guitarist Charlie Hayward is best known for playing bass on Gregg Allman's critically-acclaimed album, Laid Back. His additional credits include performing with Dr. John, as well as sitting in with The Allman Brothers Band after bass guitarist Berry Oakley was involved in a motorcycle accident. Daniels describes the new recordings as "Downhome, Swampy Rock meets Funk with a little taste of 'Delta' type of style." "The whole thing started one day when I, as I often do, was fooling around with my guitar and came up with the opening riff on a song that eventually turned out to be 'Mudcat,'" explains Daniels. "That song set the style for the rest of the songs I would write, that all lent themselves to being played in the key of E, hence the title." "Holla the Beau Weevils!" Daniels quips.